– For me this marks one of the most impressive moments of the Mediamundo Congress for sustainable media production that took place in Berlin these days. For some this term is already degraded to marketing buzzword, whilst most people just misunderstand it. Good start to become an empty shell, a dead word. The concept of sustainability roots in forestry.It has been clear to lumber men for century, that one can only fell as much as can grow again. Since in this industry often two or more generations pass between seeding and harvesting, it is no wonder that latest with the rise of wood intensive products at the end of the middle ages, like the growing fleets sailing ships becoming bigger and bigger or the salines with their increasing need of fuel to evaporate the brine, sustainability entered the economy explicitly. At the age of steal and black coal and later petrol the concept of sustainability apparently at first became obsolete. Of the 390 million tons of paper that is produced annually, Europe and the US consume just under the half. Germany with a per capita consumption of 256 kg (in 1950 it used to be just 40 kg) is just a bit short behind the US and far above the European average. Just the portion of 7.4 million tons of paper that is produced from freshly cut trees and not from recycling used paper are more then what whole Africa consumes. At first it is the huge area of forests – 20 % of global wood harvest goes for producing paper; more than 50 million cubic metres just for Germany. Apart from that a major factor is the water that is consumed in paper production. 7 litres go for one kilogramme of paper, the larger part of that remains as toxic waste. Particularly with advertising matters it is unintelligible how even valuable brands send spam mailings unabashed to distribution lists hardly filtered. Also catalogue retailers hardly ever manage to adopt to their customer’s needs, who are tired from waste paper to jam letterbox or paper basket. Junk mailings and free standing inserts that get tossed out of the newspaper by most of the readers (“de-bonning” – it has even a name!). Then the printing out Emails and other office stuff. And finally also an appeal to printer manufacturers: as long as it is even hard for technically skilled personnel to get two-sided documents printed straightaway, the back sides remain unused. Recycling paper has to become standard again. The German administrations often refer to EU law and would see a distortion of competition in restricting on certain paper qualities. Also by bid invitations no recycling ration would be provided. That this is just pretext is proofed by the Netherlands with their negotiated agreement to commit ecological paper in administration. However it is again the hardware manufacturers that are in charge here: as long as it is unclear, in how far recycling paper leads to higher abrasion and more frequent maintenance for the devices, at least some uncertainty remains for the use of recycled paper. Even a strictly ecologically oriented printing shop has to use fresh fibre paper. Trees as commodity cannot be replaced. But it is exactly here where another strength of paper lies, compared say with electronic media: it is renewable resource, to some extend CO2 is even bound permanently. 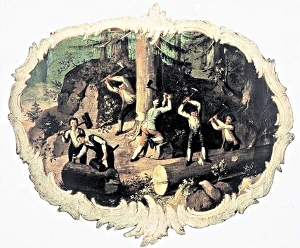 It is time to return to forestry of the times prior to the industrial revolution – to let regrow the wood that is cut. International transparent attestations like the certificate of the Forrest Stewardship Council provide the paper processing companies the security, that they would in fact buy commodity that is produced sustainably – and not just do greenwashing. It is gratifying as it is already accepted and deployed in wide parts of the business. The demand on clean wood is however so strong, that it is hardly possible to cover the needs with FSC certificated forests. To not become just utopia, a certificate has to compromise, which is not without problems. “While for some we already ring hollow, our criteria are still unaffordable for many others.”, describes Uwe Sayer of FSC Germany the predicament between credibility and practice. Paper is a wonderful medium – under reasonable good conditions, it keeps its content readable for centuries. No playing devices are necessary, no power supply. Under this aspect paper has been sustainable as such ever since. All the more important is to take the step to give also paper manufacturing a long term perspective for the future!